Berkeley Software Distribution (BSD) was a Unix operating system derivative developed and distributed by the Computer Systems Research Group (CSRG) of the University of California, Berkeley, from 1977 to 1995. Today the term "BSD" is often used non-specifically to refer to any of the BSD descendants which together form a branch of the family of Unix-like operating systems. Operating systems derived from the original BSD code remain actively developed and widely used. Although these proprietary BSD derivatives were largely superseded by the UNIX System V Release 4 and OSF/1 systems in the 1990s (both of which incorporated BSD code and are the basis of other modern Unix systems), later BSD releases provided a basis for several open source development projects, e.g. FreeBSD, OpenBSD, NetBSD, Darwin or PC-BSD, that are ongoing. These, in turn, have been incorporated in whole or in part in modern proprietary operating systems, e.g. the TCP/IP (IPv4 only) networking code in Microsoft Windows and most of the foundation of Apple's OS X and iOS. The earliest distributions of Unix from Bell Labs in the 1970s included the source code to the operating system, allowing researchers at universities to modify and extend Unix. 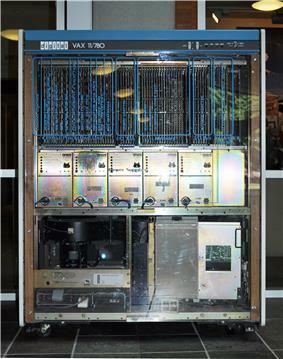 The first Unix system at Berkeley was a PDP-11 installed in 1974, running Version 4 Unix, and the computer science department used it for extensive research thereafter. In 1975, Ken Thompson took a sabbatical from Bell Labs and went to his alma mater, UC Berkeley. 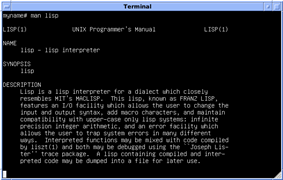 There, Thompson helped to install Version 6 Unix on a PDP-11/70. Other universities became interested in the software at Berkeley, and so in 1977 Bill Joy, then a graduate student at Berkeley, started compiling the first Berkeley Software Distribution (1BSD), which was released on March 9, 1978. 1BSD was an add-on to Version 6 Unix rather than a complete operating system in its own right; its main components were a Pascal compiler and Joy's ex line editor. The Second Berkeley Software Distribution (2BSD), released in May, 1979, included updated versions of the 1BSD software as well as two new programs by Joy that persist on Unix systems to this day: the vi text editor (a visual version of ex) and the C shell. The success of 3BSD was a major factor in the Defense Advanced Research Projects Agency's (DARPA) decision to fund Berkeley's Computer Systems Research Group (CSRG), which would develop a standard Unix platform for future DARPA research in the VLSI Project. 4BSD was the operating system of choice for VAXs from the beginning until the release of Bell System ran 4.1BSD (many still do, and many others run 4.2BSD). 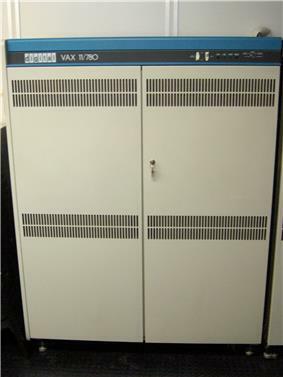 4.1BSD (June 1981) was a response to criticisms of BSD's performance relative to the dominant VAX operating system, VMS. The 4.1BSD kernel was systematically tuned up by Bill Joy until it could perform as well as VMS on several benchmarks. The release would have been called 5BSD, but after objections from AT&T the name was changed; AT&T feared confusion with AT&T's UNIX System V.
4.2BSD (August 1983) would take over two years to implement and contained several major overhauls. Before its official release came three intermediate versions: 4.1a incorporated a modified version of BBN's preliminary TCP/IP implementation; 4.1b included the new Berkeley Fast File System, implemented by Marshall Kirk McKusick; and 4.1c was an interim release during the last few months of 4.2BSD's development. Back at Bell Labs, 4.1cBSD became the basis of the Eight Edition of Research Unix, and a commercially supported version was available from mtXinu. To guide the design of 4.2BSD, Duane Adams of DARPA formed a "steering committee" consisting of Bob Fabry, Bill Joy and Sam Leffler from UCB, Alan Nemeth and Rob Gurwitz from BBN, Dennis Ritchie from Bell Labs, Keith Lantz from Stanford, Rick Rashid from Carnegie-Mellon, Bert Halstead from MIT, Dan Lynch from ISI, and Gerald J. Popek of UCLA. The committee met from April 1981 to June 1983. Apart from the Fast File System, several features from outside contributors were accepted, including disk quotas and job control. 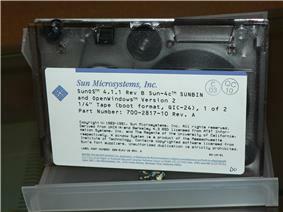 Sun Microsystems provided testing on its Motorola 68000 machines prior to release, ensuring portability of the system. 4.3 BSD from the University of Wisconsin. Browsing "/usr/ucb" and "/usr/games"
After 4.3BSD, it was determined that BSD would move away from the aging VAX platform. The Power 6/32 platform (codenamed "Tahoe") developed by Computer Consoles Inc. seemed promising at the time, but was abandoned by its developers shortly thereafter. 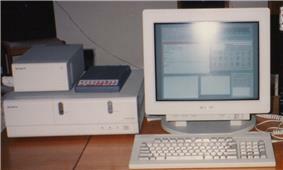 Nonetheless, the 4.3BSD-Tahoe port (June 1988) proved valuable, as it led to a separation of machine-dependent and machine-independent code in BSD which would improve the system's future portability. Until then, all versions of BSD incorporated proprietary AT&T Unix code and were, therefore, subject to an AT&T software license. Source code licenses had become very expensive and several outside parties had expressed interest in a separate release of the networking code, which had been developed entirely outside AT&T and would not be subject to the licensing requirement. This led to Networking Release 1 (Net/1), which was made available to non-licensees of AT&T code and was freely redistributable under the terms of the BSD license. It was released in June 1989. 4.3BSD-Reno came in early 1990. It was an interim release during the early development of 4.4BSD, and its use was considered a "gamble", hence the naming after the gambling center of Reno, Nevada. This release was explicitly moving towards POSIX compliance, and, according to some, away from the BSD philosophy (as POSIX is very much based on System V, and Reno was quite bloated compared to previous releases). Among the new features were an NFS implementation from the University of Guelph and support for the HP 9000 range of computers, originating in the University of Utah's "HPBSD" port. In August 2006, InformationWeek magazine rated 4.3BSD as the "Greatest Software Ever Written". They commented: "BSD 4.3 represents the single biggest theoretical undergirder of the Internet." 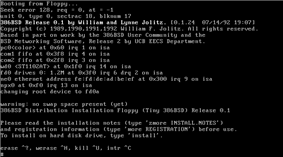 Installation of 386BSD. 386BSD was an early port of BSD to the Intel 80386 architecture. After Net/1, BSD developer Keith Bostic proposed that more non-AT&T sections of the BSD system be released under the same license as Net/1. To this end, he started a project to reimplement most of the standard Unix utilities without using the AT&T code. 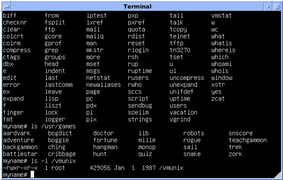 For example, vi, which had been based on the original Unix version of ed, was rewritten as nvi (new vi). Within eighteen months, all of the AT&T utilities had been replaced, and it was determined that only a few AT&T files remained in the kernel. These files were removed, and the result was the June 1991 release of Networking Release 2 (Net/2), a nearly complete operating system that was freely distributable. The lawsuit slowed development of the free-software descendants of BSD for nearly two years while their legal status was in question, and as a result systems based on the Linux kernel, which did not have such legal ambiguity, gained greater support. Although not released until 1992, development of 386BSD predated that of Linux. Linus Torvalds has said that if 386BSD or the GNU kernel had been available at the time, he probably would not have created Linux. In addition, the permissive nature of the BSD license has allowed many other operating systems, both free and proprietary, to incorporate BSD code. For example, Microsoft Windows has used BSD-derived code in its implementation of TCP/IP and bundles recompiled versions of BSD's command-line networking tools since Windows 2000. Also Darwin, the system on which Apple's Mac OS X is built, is a derivative of 4.4BSD-Lite2 and FreeBSD. Various commercial Unix operating systems, such as Solaris, also contain varying amounts of BSD code. Current BSD operating system variants support many of the common ISO, and POSIX standards, while retaining most of the traditional BSD behavior. Like AT&T Unix, the BSD kernel is monolithic, meaning that device drivers in the kernel run in privileged mode, as part of the core of the operating system. BSD has been the base of a large number of operating systems. Most notable among these today are perhaps the major open source BSDs: FreeBSD, NetBSD and OpenBSD, which are all derived from 386BSD and 4.4BSD-Lite by various routes. Both NetBSD and FreeBSD started life in 1993, initially derived from 386BSD, but in 1994 migrating to a 4.4BSD-Lite code base. OpenBSD was forked in 1995 from NetBSD. The three most notable descendants in current use—sometimes known as the BSDs—have themselves spawned a number of children, including DragonFly BSD, FreeSBIE, MirOS BSD, DesktopBSD, and PC-BSD. They are targeted at an array of systems for different purposes and are common in government facilities, universities and in commercial use. A number of commercial operating systems are also partly or wholly based on BSD or its descendants, including Sun's SunOS and Apple Inc.'s Mac OS X. In the past, BSD was also used as a basis for several proprietary versions of Unix, such as Sun's SunOS, Sequent's Dynix, NeXT's NeXTSTEP, DEC's Ultrix and OSF/1 AXP (now Tru64 UNIX). Parts of NeXT's software became the foundation for Mac OS X, among the most commercially successful BSD variants in the general market. FreeBSD, an open source general purpose operating system. PC-BSD, GhostBSD and DesktopBSD, distributions of FreeBSD with emphasis on ease of use and user friendly interfaces for the desktop/laptop PC user. FreeNAS a free network-attached storage server based on a minimal version of FreeBSD. NAS4Free fork of 0.7 FreeNAS version, Network attached storage server. The OS for the Netflix Open Connect Appliance. Isilon Systems' OneFS, the operating system used on Isilon IQ-series clustered storage systems, is a heavily customized version of FreeBSD. NetApp's Data ONTAP, the operating system for NetApp filers, is a customized version of FreeBSD with the ONTAP architecture built on top. m0n0wall, a FreeBSD distribution tweaked for usage as a firewall. Pfsense open firewall and router. NetBSD, an open source BSD focused on clean design and portability. OpenBSD, a 1995 fork of NetBSD, focused on security. MirOS BSD, a fork of OpenBSD with additional features such as European localizations. ekkoBSD, a discontinued fork of OpenBSD, now partially merged with MirOS. MicroBSD, an OpenBSD-based operating system with a small memory footprint. Coyote Point Systems EQ/OS, a hardened high-performance runtime for server load balancing. Force10 FTOS, the operating system for Force 10 and Dell datacenter network switches. Dell DNOS version 9 and above, the successor to FTOS. F5 Networks, F5 BIGIP Appliances used a BSD OS as the management OS until version 9.0 was released, which is built on top of Linux. ^ Toomey, Warren. "Details of the PUPS archives". tuhs.org. The Unix Heritage Society. Retrieved 6 October 2010. ^ Mueller, Walter (2009-01-04). "2.11BSD Patch 446+447; fixes for ulrem,umount,tar,tcsh,ps,vmstat,apropos,pstat,rk". www.classiccmp.org. Retrieved 2013-09-10. ^ a b c Quarterman, John S.; Silberschatz, Abraham; Peterson, James L. (December 1985). "4.2BSD and 4.3BSD as examples of the Unix system". Computing Surveys 17 (4): 379–418. ^ M. K. McKusick in Open Sources, O'Reilly. ^ Hibler, Mike (July 1999). 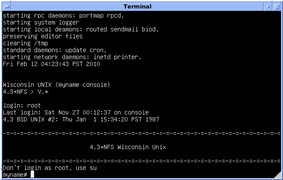 "HPBSD: Utah's 4.3bsd port for HP9000 series machines". Retrieved 10 February 2014. ^ Babcock, Charles (2006-08-14). "What's The Greatest Software Ever Written?". ^ Linksvayer, Mike (1993). "The Choice of a GNU Generation — An Interview With Linus Torvalds". Meta magazine. Retrieved 2009-01-20. ^ L. Torvalds (January 29, 1992). "Re: LINUX is obsolete". ^ Eric S. Raymond. "The Art of Unix Programming: Origins and History of Unix, 1969-1995". Retrieved 2014-07-18. ^ "BSD Code in Windows". everything2.com. 2001-03-20. Retrieved 2009-01-20. ^ "BSD Usage Survey". BSD Certification Group. 2005-10-31. Retrieved 2009-01-20. ^ "Netflix Open Connect Appliance Deployment Guide". May 29, 2012.